During my time in Europe I have been blessed with a wealth of incredible experiences. There has been no city that I have visited that has made me more aware of this – or more grateful – than Berlin. The city has a special feel to it – a unique character – that will no doubt touch any visitor to its streets. When I found out that one of my closest friends – Rick Podkowa – had signed a professional football contract to play in Germany, I immediately began planning when and where we could meet. Meeting up in Europe was something we used to stay up late dreaming about over a drink in the Banshee. Thanks to a seemingly random fusion of coincidences this ideal became a reality for a small contingent of our closest group of friends. Ricky, I had so much fun killing it with you in Berlin – it is an experience that I will never put out of my mind. After a ten-hour-overnight train ride from Bratislava (40 Euro with a seat reservation) I sat down at a computer in the hostel St. Christopher’s at 10am on Friday morning waiting for Ricky and Jesse to come in from Lubeck, Germany. I was busy responding to an email when I was surprised from behind by Rick … he had arrived early. We embraced and smiled as we began to comprehend how incredible this weekend was going to be – what it is going to mean to us when we look back on these times in the future. We grabbed a bite to eat at the hostel and set out to do some sightseeing in the afternoon. We took the short U-Bahn ride to Alexanderplatz, where we photographed the radio tower and Marienkirche. We were still getting warm to the city as we moved towards the Brandenburg Gate and Reichstag. After seeing these two sites we sat on a curb outside the Reichstag for a beer, got a couple coffees, and moved on to the next destination. After these two sites – probably the most well known in Berlin – we headed to Checkpoint Charlie. In this area you can read the extensive history of the Cold War conflict as it relates to East & West Berlin written on a long wall that leads up to the Checkpoint. The checkpoint itself is a replica built on the exact site where the original stood years ago during the Cold War. Outside of the small hut stands a “street performer” dressed in U.S. fatigues accepting a euro or two for photo opportunities with tourists. The highlight of this remembrance is definitely the Checkpoint Charlie Museum. Filled with historical photographs, paintings and documents, the museum is a must. For 12 euro, one can gain a better understanding of this conflict, and how it affected the people living in Berlin. In my opinion, the effects are still being felt today. I was struck by the extensive record of missing and dead in the Checkpoint Museum – normal citizens who were arrested, deported, tortured, or murdered by the Soviet regime that was pulling the strings in East Berlin at the time. This period in time was so important because it demonstrated the power of oppressed and divided peoples to unite towards their common interest – freedom – and overcome. After Checkpoint Charlie we wandered back to the hostel for a shower and a drink. We asked some locals working at the hostel for some recommendations and headed to the White Trash Fast Food club to get a taste of the Berlin nightlife. Don’t let the name or the seedy underground feel of the club turn you off. Despite the talentless live band or the crappy rock songs interspersed (aka Bon Jovi) we danced well into the morning. Just remember, the pins they give you when you get your bottles of beer are not free keepsakes, they are meant to remind you to return the bottles to get your deposit back. We realized the next morning we could have gotten a euro back on every bottle we bought. So it goes: we weren’t about to cry over spilled milk, we still had a Saturday and Sunday ahead of us in one of the raddest cities in the world. On Saturday, we met up with a friend – Carolin – who became friends with the girlfriend of one of our good friends while studying in the United States. She came with her friend Martin, who offered to use his tour-guide-skills (he is studying to become a professional in the tourism field) to give us a more local taste of Berlin. 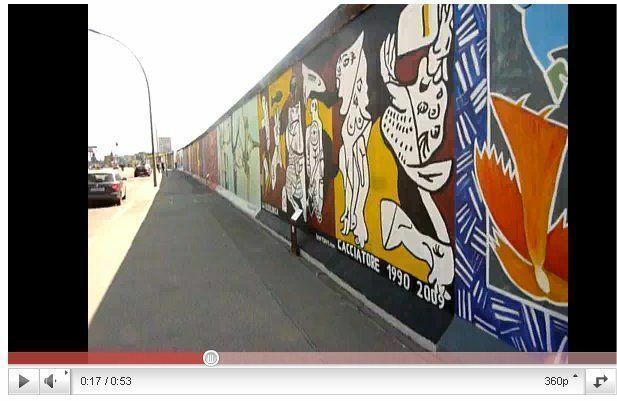 We started our tour by making our way over to the East Side Gallery. The gallery – located in East Berlin – is actually located on the part of the wall still standing here. The gallery is a collection of paintings created by various Berliners. As part of a recent renovation project these artists have returned to the wall to retouch or repaint these pieces in order to get rid of the graffiti that had previously plagued it. The paintings represent the oppression the people of Berlin faced communicated by representations of their feelings about their common interest in freedom and reunification with their West Berlin counterparts. After strolling down the entire gallery, we took a right, crossed a bridge, and headed into the Kreutzberg neighborhood. We were all charmed by the warm feel of this area. Open streets, small cafes, and an occasional store selling various odds and ends from twenty year old prescription glasses to a Russian typewriter. After a big coffee from Subway (smile) we took the S-Bahn to go poke around Potsdamer Platz. Potsdamer Platz is a very modern, very busy business center. High(er) rise buildings give home to hotels, sushi restaurants, and business offices at their feet. Walk into the nearby business center and you are in an circular, semi-indoor pavilion lined with restaurants, shops, and other attractions. A little too busy, and a little too much fluff for me. From the Potsdamer Platz we went back towards the Brandenburg Gate to see the Holocaust Memorial. As you look out on the memorial you see a field of squared cement blocks that look relatively even-laid. As you enter the memorial you realize that the ground level fluctuates, and that some granite stones are taller than others. As our friend Martin explained, the design represents the confusion and ambiguity that faced many Europeans living in places where the Holocaust was so thoroughly perpetrated. Like these people, one walking through the monument may often be unsure of his position, how deep he is, or which is the best way to get out. It is a very significant and very powerful memorial. After the memorial, it was finally time to exhale over some traditional German food. A tall beer and order of pork knuckle with sauerkraut later, we were ready to set out for the night. I’d be remiss if I didn’t mention the incredible experience we had on Sunday. We took heed to the various recommendations by locals to make it out to MauerPark for Sunday afternoon karaoke. Aside from the long stretch of open-air markets and vibrant atmosphere in the park, Bearpit Karaoke convenes every Sunday in the old amphitheater nearby. Sitting on haphazardly placed slabs of concrete and stone, two thousand people gather regularly to watch brave participants sing their favorite songs. We heard Queen, we heard Michael Jackson, we heard Backstreet Boys. In the moment, all of them were good. The entire Sunday experience in MauerPark was characterized by positive energy and a young and progressive atmosphere. I highly recommend this event to any visitor to the city. I hope I can someday return to MauerPark on a Sunday to sing my favorite song as a token of my gratitude for Berlin and the incredible experiences it harbored for us. All of the pictures I took are available on my Flickr page, the link to which is available on the homepage to my journal. A short video compilation is forthcoming. Thanks again to everyone who has been following me around Europe, I wish you were here with me.